Tuatha Dé Danann - the People of the Goddess Danu, were a race of divine beings, said to have inhabited Ireland before the occupation of the Gaels or Celts. They were skilled in magic and in Druid lore. In Wales they are called the Tylwyth Teg - the Fair Folk. The circles in the grass of green fields are still called cylchau y Tylwyth Teg - faerie rings. Faeries were things under the earth, for they were generally supposed to dwell in the lower regions, especially beneath lakes. The people of Pembroke imagined that they inhabited certain enchanted green isles of the sea. After the coming of the Gaels, the Tuatha Dé were driven underground, to establish an Otherworld kingdom beneath the hills, Tir na nog the Land of the Forever Young. The Celts were a people who lived close to nature. The cycle of the seasons, cosmos, earth, elements, plants, animals, humanity, and otherworldly beings, are expressed throughout Celtic mythology and religion. 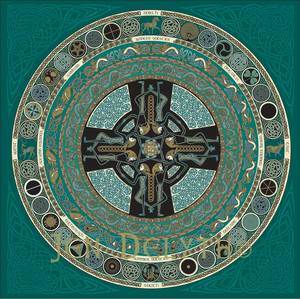 In this design, the people of Danu are woven into the ancient cross-symbol creating a mandala celebrating the Spirit in Nature and inter-connection of all living things.